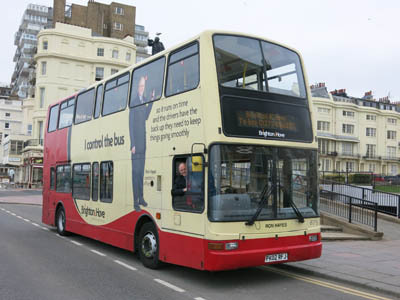 Connections with Brighton and Hove : Ron Hayes – Operations Manager for Brighton & Hove Bus and Coach Company Ltd, has after 45years in the industry has decided to retire on Friday 27 March 2015. 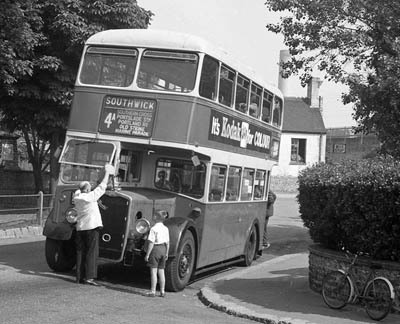 As Ron will tell you himself his long fascination with buses started at the age of 6, he spent many an hour in Southwick Green terminus, so starting his long career with Southdown Motor Services on the 2 March 1970 was somewhat inevitable, he was promoted to Inspector in 1979, where he was the youngest in the country at that time. 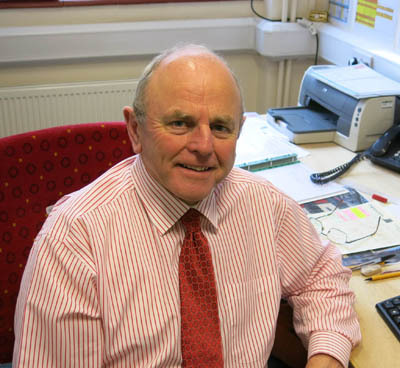 Ron’s service to Brighton & Hove started with him transferring on the 1st May 1987, and in 1990 he was then promoted to a control Inspector which he did with usual dedication until 1998 when he was again promoted to an Operations Controller. In 1999 Ron took on added responsibility with the position of an acting Staff Manager at Lewes Road until 2001 when he became Operations Officer and later Senior Operation Controller in 2005. 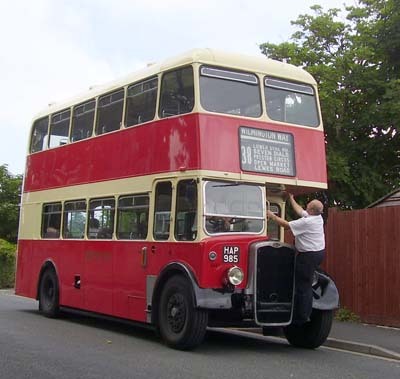 In 2007 Ron appeared on the side of one of our vehicles 875, which today can still be seen in operation on route 2, this too will retire later this month so for both 875 and Ron’s last days of service, the bus will carry Ron’s name too. 2012 saw Ron nominated for and winning the unsung hero award at the UK Bus awards, a very prestigious and well deserved award. Ron is today and has been our Operations Manager since 2012, he looks after our busy Brighton operations and gets up at 0400 every morning to ensure all is as expected, a true work ethic that has seen him through these many years. As you can see Ron has covered a very wide reaching career within the business and his retirement is a well-deserved rest, he will be missed by all who have worked with him. 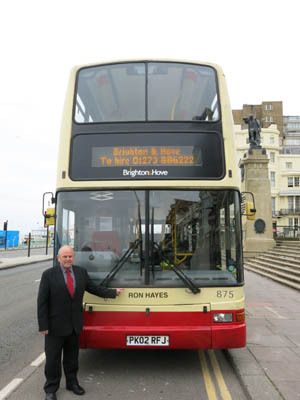 So congratulations Ron for the very impressive milestone and have a happy and worthwhile retirement from all of us here at Brighton & Hove Bus and Coach Company Ltd.
875 Dennis Trident - Name changed to Ron Hayes March 2015 to commemorate his retirement after 45 years of service. Bus sold in April 2015. Ron Hayes as young lad watching the conductor change the screen and then years later Ron changing the screen himself.